"I could have also put this text under the title On the chirality of enclosed spaces. Actually, stereochemistry, crystallography and contradiction principle gave me the proper codes in interpreting Vlad Nanca’s object. Chirality designates a chemical property of non – superimposable molecular compounds, with optical symmetry and structural similarities. Arranged in space, the compounds are situated in perfect mirroring, in a double configuration (as dual mode), but, simultaneously, oriented in opposite directions. +α | -α. Playing furthermore with contradiction, the installation reveals its fundamental ambiguities. By definition, a chiral compound is an open, moving structure, while Vlad’s assemblage freezes a monolithic one, resembling much more to the static type in a twin crystal than to the molecular dynamics. At a first glance, we could fairly invoke stasis. In his synopsis, Vlad describes the story of two football goals, gloriously embraced in a sort of a “happy end” completely solving the clash, annihilating the game itself and annulling the very possibility of a future conflict through the metamorphosis into the peaceful skeleton of some sort of housing. 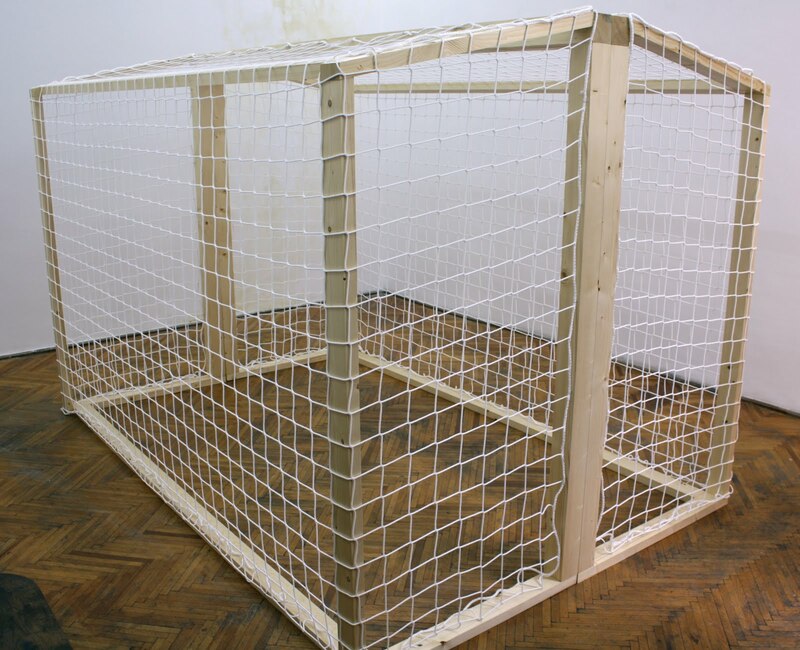 But since ambiguity endlessly regulates all the transformations in meaning, the same enclosure can easily become cage, trap or prison, subsequently invalidated by the porosity of the reticulated net that launches once again the object in the middle of associative turmoil. The continuous shift provoked on different levels of signification or taxonomic inventories (it is an object, an installation, a maquette, or an edifice) proves the need for permeable thematic readings, able to test themselves through self-suspension or antiphrasis. Shifting, opposite perspectives could explore (and I feel the need of conjuring now Walter Benjamin) both the methodological, combining potential in dialectic images that fulgurate reality, deregulate and enrich it and the metaphorical potential of so-called “thought-images”/ Denkbilder, where the narrative form conveys theoretical thinking and becomes concept. The ambiguous object mounted by Vlad formalizes one fundamental polymorphism: as perceptual experience, through amplification at monumental scale he inverts the claustrophobic sensation and, paradoxically, expands it; as dimensional orientation when the object turns out to be a device for counting spatial articulations or pulsations, a counter of our own spatial landmarks around us and for the loss of them; as semiotic density, where the main constituents power the symbolic meaning – goal pillars, linguistic similarities, goal and competition, goal and gate inflexions, gate as passage, gate as threshold, net, blocking net, grid (in transmissions and connexions), formation grid. I believe that is this very semiotic consistency that makes that the ambiguous object “has a lot to say”, keeping itself open (and not necessarily transparent) for interwoven, interlinked analysis. The English expression “wired grid” mobilizes again reflexive associations. I would like to mention here two famous names of historical conceptualism and minimalism, whose works could give another indentation in this constellation. Trying to test the multiple configurations of reality in its infinite deployment, Robert Smithson has verified the purity in geometric reflective structures in a well-known series inspired by optical isomers: “Enantiomorphic Chambers” (1965). My second example is taken from the canonical context of minimalism. Aspen Magazine’s minimalist number, edited by Brian O’Doherty, has published in 1967 Tony Smith’s project for “The Maze” (crisscrossing of symmetrical and square grids), where the artist imagines a genuine “labyrinth of the mind rather than a monument”, where pathways are consubstantial to the entire design, unwillingly disavowing the impossibility of objective neutrality in art object. Mirroring the twofoldness of the goals in a perfect enantiomer, Vlad Nanca manages to detour the post-minimalist object through the kissing anecdote (a reminder of Brancusi relenting remnants in our artistic automatisms related to the gate symbolism); and he manages also to dissolve further away, with equal irony, the anecdote in contingency, since he doesn’t want to block the object in simple historiographic reading. With its proliferating semantics, Vlad Nanca’s object becomes a “dialectic image”. It’s a new way of conceptual expression, filled with subjectivity, gathering the right amount of ambiguity under the tricky appearance of a crystalline symmetry."